U14 Romanian championship; 2014/2015 season. Final round. U Mobitelco Cluj-Napoca 78 – 81 BC EKO Sighetul Marmaţiei. Game played in 05.06.2015 in Bucharest, at Romanian Basketball Federation Arena. 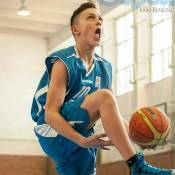 Ciprian Albu is born in 06.08.2002 (U13) and he was competing in the U14 championship. U14 Romanian championship; 2014/2015 season. Game played in 06.06.2015 in Bucharest, at Romanian Basketball Federation Arena.